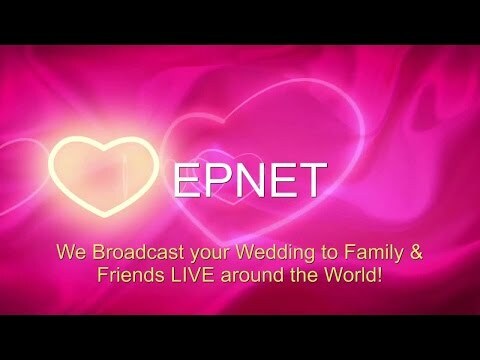 Webcasting Epnet » Wedding gift idea videographer Johannesburg Live Streaming. Johannesburg area video for weddings if you are getting married Epnet provides a service to couples to document their wedding in a video. Remembering this once in a lifetime day forever a video live streaming on the web or simply recorded and supplied on a flash drive is the greatest most cherished possession for a married couple and lasts a lifetime. Your wedding video is something you can show your children who will be grateful that they were able to share this special day that you both experienced. A video production by Epnet the videographer in Johannesburg includes a live film production editor at your venue using three discreet cameras and you don’t have to wait months for the delivery of your film (which is common place). We deliver a memory stick before we leave your wedding celebration. You also have the option to broadcast from Johannesburg by live streaming your marriage around the world on the web. We are based in Johannesburg but cover the whole of Gauteng and are available to you anywhere in the region. If you are a parent or close relation to the couple a video would be an ideal gift and completely unique. Give them a special gift to remember on their big day with our commemorative and personalised video. We include an optional recording of you with your greeting and (marital advice), wishing the couple well which we place in the front of the video. Ensure your unique video wedding gift lasts a lifetime!